Say it slowly… “Lemon Bar Ice Cream Cake”…. Disclosure: This post was sponsored by Halo Top Creamery. As always, I only work with those brands I myself endorse and purchase for Mr. CEO and I. Thanks for supporting the companies that help keep me up and running! Your mouth is already watering, huh? Don’t worry- in just a few short minutes you can head out the door and grab the ingredients to make this delicious Lemon Bar Ice Cream Cake! But, before you reach for your keys, let’s chat real quick. I like to make lists when I think about things; you do too, right? Well here’s the top 3 things that came to mind as I started to think about why I needed to create a Lemon Bar Ice Cream Cake. Hopefully it inspires you to whip up this taste treat, too! 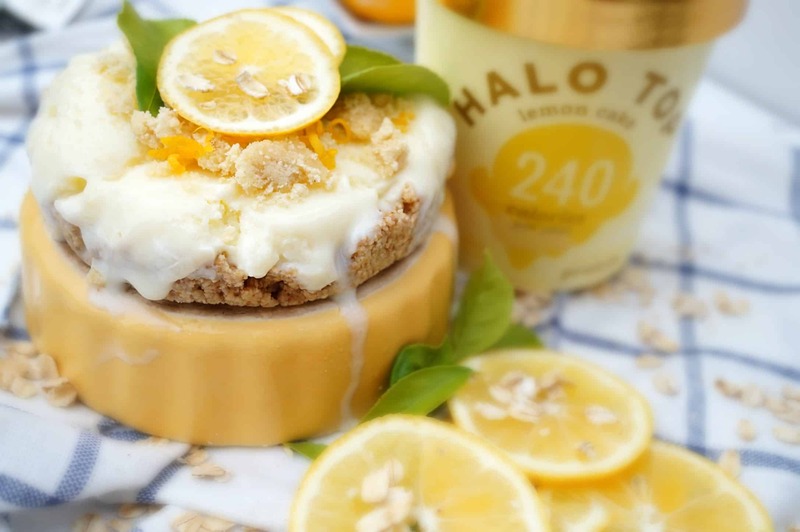 5 Reasons this Lemon Bar Ice Cream Cake needs to be in your summer treat rotation! Reason #1: It’s filled with flavor, while also chalk full of nutrition! Just how does an ice cream cake actually make my RDN stamp of approval? Enter, Halo Top Creamery! This delicious and nutritious frozen dessert tastes just like ice cream, because it is! Plus, it’s allergen friendly, gluten free and has over 6 grams of protein per serving. Reason #2: I can have my cake, and eat it too! Did you know the average Lemon Bar has over 8 grams of saturated fat, 35 grams of sugar, 0 fiber and under 3 grams of protein? 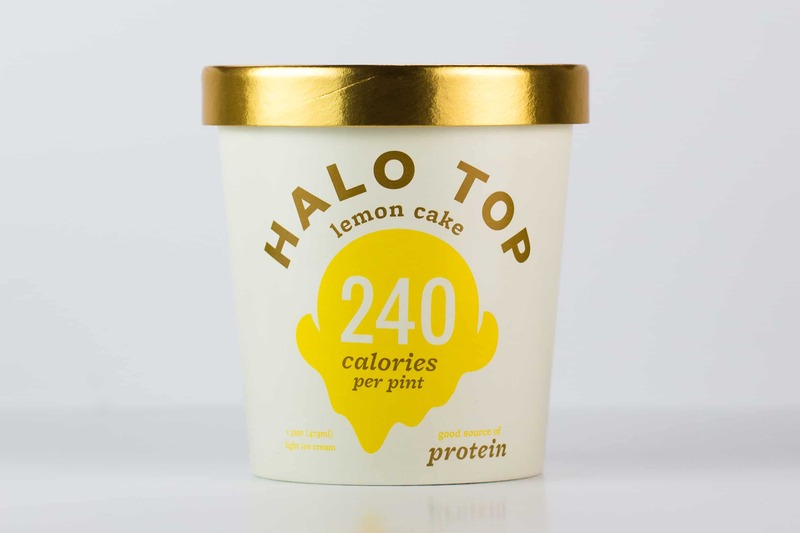 Well, this Lemon Bar Ice Cream Cake is your new best friend, because in one cake, you get over 13 grams of protein, 9 grams of fiber, only 5 grams of sugar and just under 3 grams of saturated fat. Yep, say it with me, #winning! Reason #3: It melts in your mouth, not in your hand! Tired of going to BBQs and having that delicious dessert table get destroyed by the summer heat? Me too! The beauty of this recipe is that you can leave in the freezer just until it’s time for dessert. Dress up your table with hints of lemons and bright colors so you entice your guests and leave them guessing as to what you have up your sleeve for their sweet tooth later in the party! Now you have it! See I told you it wouldn’t take long! 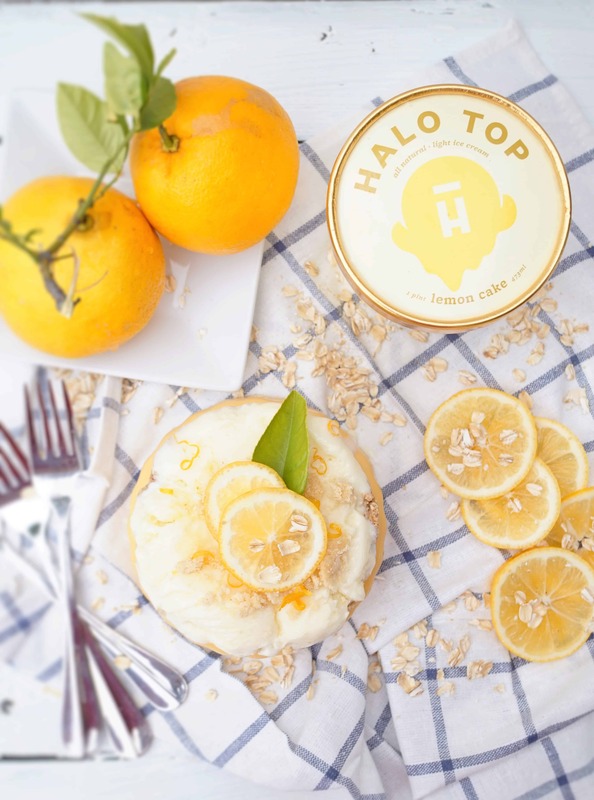 Head on over to Halo Top’s website, search for the store closest to you, grab your keys, buckle up and in no time you’ll be diving into this beauty with me too! I’ll see you soon in summer bliss! A lightened up version of Lemon Bars, this sweet frozen treat will win your summer guests and leave you feeling satisfied and satiated! In a food processor, combine option 1 (oats, almonds, oil) or option 2 (cookies and margarine) and pulse until coarse like consistency is formed. Line 4 ramekins with wax paper and firmly press 2 tablespoons or so of the mixture into the bottom of the dish. Freeze for 20 minutes. Freeze again and enjoy at your leisure! Are you a Lemon Bar Ice Cream Cake fan? No worries if you prefer another variety, Halo Top’s got you covered with Birthday Cake, Chocolate, Chocolate Mocha Chip, Vanilla Bean, Strawberry and Mint Chip, too! Oh yes! 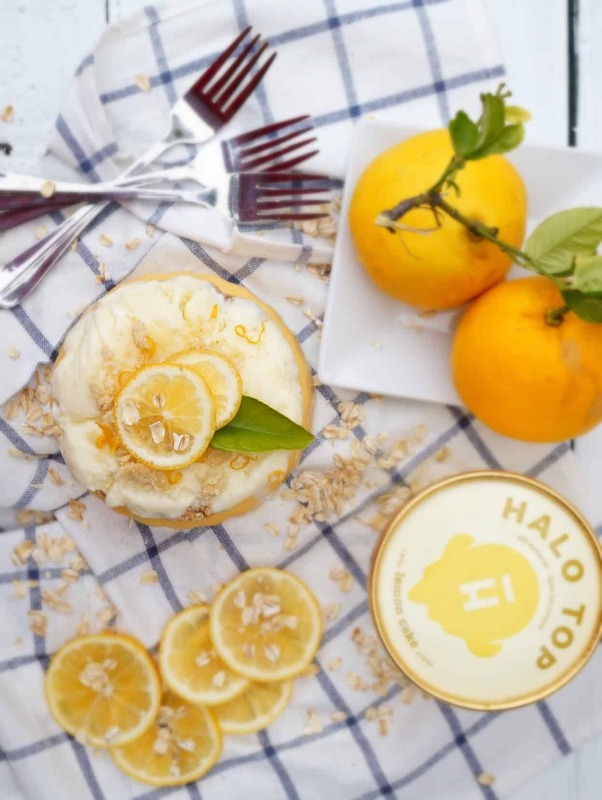 Halo Top is so delicious, especially the lemon! Wowza! This Lemon Bar Ice Cream Cake is totally calling out my name. I love lemon ice cream-this looks amazing Liz!! Thanks Gretchen! That means so much- EA is a great teacher! I hope you go for the gold and get this gem! You and your family will love, I promise you! Perfect with fresh fruit and the strawberry flavor! I love Halo Top!! One of my fave flavors and this looks like the perfect summer dessert! I love desserts like this because you don’t feel guilty after eating it either! Protein Dessert!! I am so glad I found a fellow Halo Top lover, too! I now want to come up with a Mocha Cake with their Mocha Chip flavor, lol! Where has this been all my life?! I love lemon desserts, and this is definitely going into my rotation! Oh yay- I hope you enjoy Melanie! This is such an incredible dessert idea! I love how it’s just bursting with lemon – I’ve actually been wearing a little thin on chocolate lately! Thanks Alisa! Would be perfect to if you need a dairy free option with a homemade nice cream too! Saying it s l o w l y OH MY GOSH!!!!!!! Slurp. I’ve seen lots about this brand, but haven’t tried it yet. Your gorgeous photos make it look even better! PS I love those IKEA towels, I use them WAAAAAYYYYYY more than all the pretty fancy ones I’ve bought. Simple is totally the best! This lemon bar ice cream cake looks AMAZING! Your pictures are beautiful! Love lemon bars and lemon anything, so know I would love this. And I have not seen Halo Top ice cream … hope it’s available near me, will check the store locator. 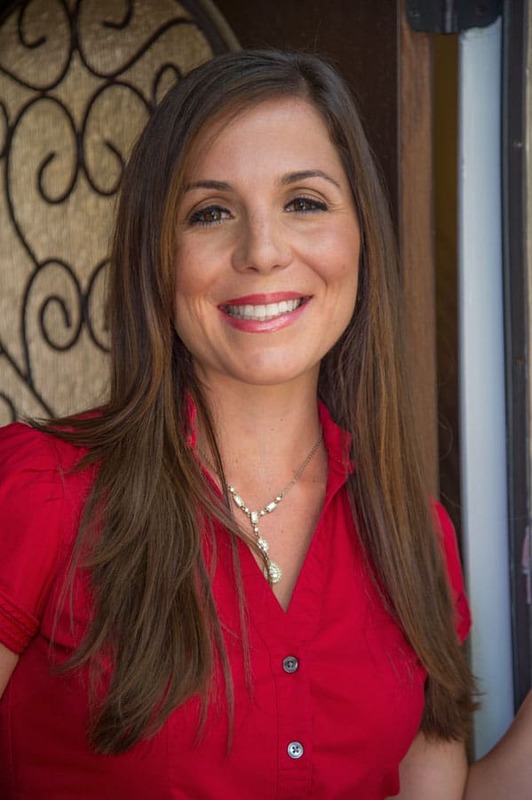 Thanks so much for reading Jenny! Let me know if you can’t find it, I’m sure we can do something about that! This sounds AMAZING with the shortbread crust. I need to try that brand of ice cream since I keep hearing amazing things about it! You definitely need to try it!!! I am obsessed with this now! I hope you love it, too! I have heard great things about this ice cream! This dessert sounds so refreshing! Thanks!! It totally is, worth every penny! This dessert is perfect for the summer! Fresh lemons and Ice cream make the perfect refreshing dessert! This sounds so refreshing and perfect for the summer! Loving all things lemon lately! I don’t know what I love more, this recipe or the stunning photos you took of this recipe! 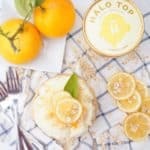 I love halo top, I can’t wait to make this for my hubs! Awe that’s so kind! Thanks Em! I can never get enough lemon treats—this one sounds amaaaazing! Guess I need to head to the grocery and fast! I thought you might enjoy the lemon!